Windows: With the release of Yosemite, even the most diehard fans of Microsoft's OS at least once thought about moving to Mac OS X. Reasons may be different, but in case they are the appearance and style, then there is a nice solution that you can try out. Yosemite Transformation Pack (just like the previous Snow and Mavericks packs) is basically a theme for Windows: a collection of various programs that'll be automatically installed, transforming your Windows in a Mac. Installation process allows for a small customization, but you'd probably want to accept almost everything that the program suggests. After a reboot you'll get a nice new Yosemite look for Windows (light and dark versions are available). Almost every GUI element will be changed: wallpaper, icons, menus, sounds, and so on. The usual Windows taskbar will be moved onto the top, while a customizable Dock (that's a RocketDock) will be at the bottom. A bunch of additional functions will be available, such as virtual desktops (powered by VirtuaWin), Launchpad-styled application menu (press F4) and widgets menu (press F12). This may not be a carbon copy of Yosemite (sometimes animation is not as smooth as in the original) but if you're tired of traditional Windows look, this is one of the best options. You can uninstall it via the Control Panel, so the "going back" process won't be hard. Still, I recommend making a backup before you install it, just in case—sometimes these things can be finicky. 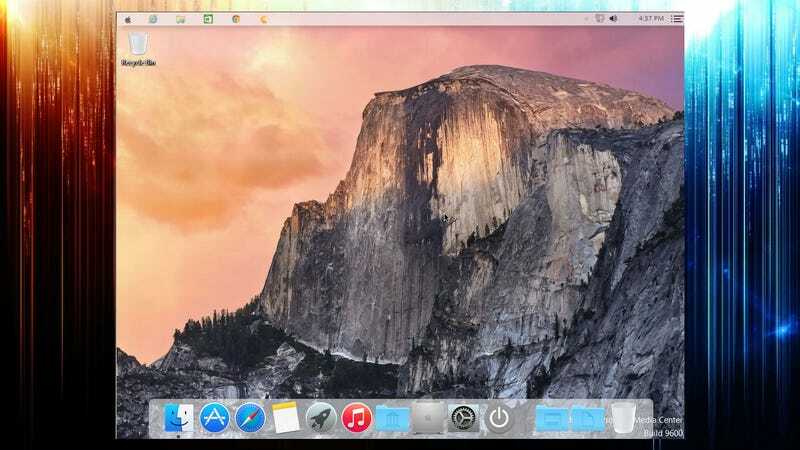 Yosemite Transformation Pack is a available for Windows 8.1/8/7/Vista/XP.